Customers in the UK and Ireland can claim a welcome bonus when opening a new account and using Paddy Power Promotion Code. When you sign up and place your first bet Paddy Power will refund it in cash if it is a losing bet. This signup bonus is for sports customers only. The Paddy Power promo code is not a bad current offer for new customers, though better offers are out there. Other promotions are offered at Paddy Power and include everything from money back specials to free bets. A Greyhound Money Back Special, Cricket Money Back Special, Horse Racing Extra Place Special, Casino offers and more are available on the site. Ireland’s biggest bookmaker are now in league with Betfair in the UK and as one of the biggest sites out there, Paddy Power offers a huge number of markets in just about every sport or event under the sun. If betting on major events, especially within football or horse racing, you will not struggle to get your bet on and have it enhanced by the current Paddy Power promo code. PP’s reputation as the ‘home of the money back special’ is well earned and so a lot of football bets feel like a free hit. During the Paddy Power review we noticed that, despite horse racing being their bread and butter, football is where they excel. Dozens of markets are available even on such games as under-21 internationals and make sure to keep an eye on Paddy Power’s fluid bonus structure which will help you boost your winnings. In a typical first goalscorer market, Paddy Power will be best priced on a few of the main contenders and their football odds overall look perfectly fair. Allied to these odds are Paddy Power’s regular money back specials which give us a sort of insurance on football bets. The Paddy Power review couldn’t really pick a fault with the odds and markets PP are offering as such. More to the point, Paddy Power very rarely offer the lowest price on a selection which is an important factor to note. 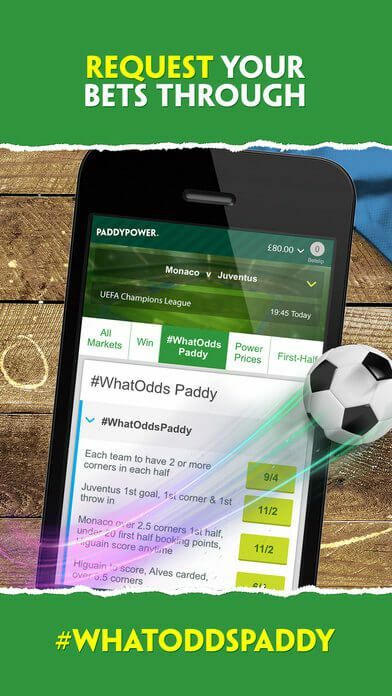 Among its range of mobile sites and apps, the Paddy Power Sports app is the most popular. Given its colour scheme it is not the most aesthetically pleasing, but it behaves perfectly well and gets the job done. The Paddy Power Sports app can be downloaded via the main site, iTunes or the Google Play store. Do make sure to watch out for the navigation bar at the bottom of the Paddy Power mobile app screen from where you can update yourself on the latest promos. Other apps available to download are Casino, Games, Lotteries and Bingo. When browsing these for the Paddy Power review though, it seems the Sports app is by far the most comprehensive which is understandable given the firm’s background. The mobile site works in a similar way to the sports app and behaves very well. It’s quick, comprehensive and gets the job done so you can bet on a large range of Paddy Power markets while on the move. Streaming makes using Paddy Power all the more fun and this is where they stand out against some of the smaller firms. Paddy Power’s live streaming section covers primarily cricket, tennis and of course football and is a fairly clear and comprehensive service. Despite several firms creeping closer to the big boys in terms of what they can offer, live streaming is what is truly separating the men from the boys in the online betting market and our Paddy Power review notes that they are right up in the top echelons now. Even aside from streamed events, Paddy Power’s live in-play offering is substantial and covers just about every sport. Football is the most comprehensively covered in-play sport with dozens of markets available during games plus a cash-out option, though not all markets have cash-out. Something to bear in mind when using the Paddy Power promo offer is that free bets cannot be cashed out. The website is clear in stating that payouts to customers on cashed out bets will be settled immediately, but funds may take a little while to hit accounts which is standard practice. Deposits and withdrawals at Paddy Power can be handled via credit or debit card (Visa and Mastercard), bank transfer, Skrill or Neteller. These methods are standard now among online bookmakers with deposit minimums being £5 for all payment methods. In a style befitting the ‘lad culture’ it embraces in its adverts, Paddy Power’s customer service is friendly and approachable. If you require help with your Paddy Power account, the customer service phone line is free in the UK. As well as their usual thread, Paddy Power has a twitter handle (@AskPaddyPower) which is available for advice every day. Having embraced social media so well, this has proven to be a big hit and one of the quickest ways to get the answers you need. The Paddy Power review is very positive overall due to their strong customer service skills, fluid money back offers and comprehensive betting markets with streaming. Paddy Power have a strong online game at present and it is only getting better. The colour scheme is off-putting and that affects the app somewhat, but the product is good and so is the service so there is very little to complain about.